Dr. Amy D’Aprix is a gerontological social worker who is an internationally renowned expert on lifestyle issues relating to caregiving, retirement, aging, and family dynamics. Using her 30+ years of professional experience working with and on behalf of older adults and their families, she gives down-to-earth, practical, and professionally informed guidance and advice. She has authored the book From Surviving to Thriving: Transforming Your Caregiving Journey (Chapel Hill, N.C.: Second Life Press, 2008), and has written numerous articles for print and online publications. She is the International Vice President on the Board of Directors of the International Federation on Ageing. In October of 2016 she received a Professional Achievement Award from her Alma Mater, Case Western Reserve University. 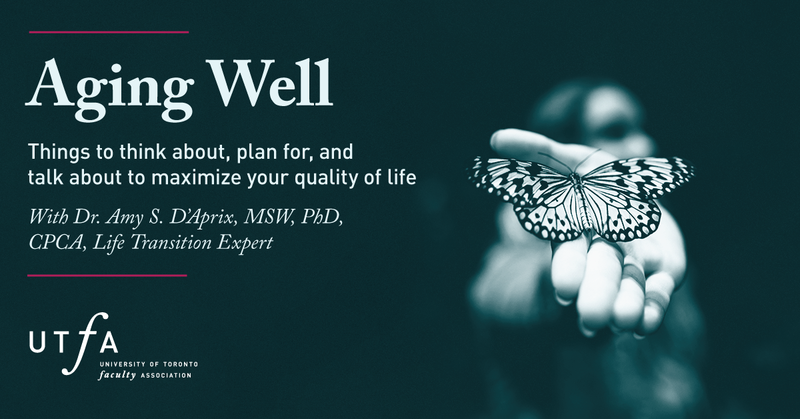 Amy holds an MSW, a Ph.D. and the designation of Certified Professional Consultant on Aging (CPCA). In addition to her professional and academic experience, Dr. Amy spent a decade caring for her own parents. The poster for the event can be viewed here. Both of the venues for this event are wheelchair accessible. To attend, please email faculty@utfa.org or call 416-978-3351.